New London’s previous basketball success had come on the boys side. MaxPreps photo by Paul Stockman. Lexus Childs-Harris remembers the bad old days during her freshman and sophomore seasons with the New London (Conn.) girls basketball team, a time in which she and the Whalers lost 35 of 40 games. “I remember going home being frustrated and wondering why (we weren’t winning) a lot of the time,” Childs-Harris said. “We had the talent. I’d just wondered why we weren’t up to par. Childs-Harris is a senior now, and the bad old days are a thing of the past for her and New London. 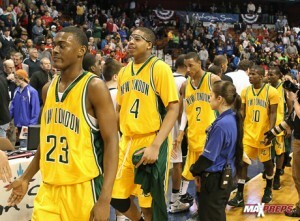 The Whalers (23-4) will play Morgan (Clinton, Conn.) in Sunday’s CIAC Class M final at Mohegan Sun Arena. View the entire CIAC Class M bracket. It’s the first state championship appearance in New London girls basketball history. It’s the Whalers first winning season since 2005.